Doubly charged microhydrated adducts formed from catechol and calcium(II) were produced in the gas phase using electrospray ionization (ESI) appearing as the most important ions in the mass spectra recorded. 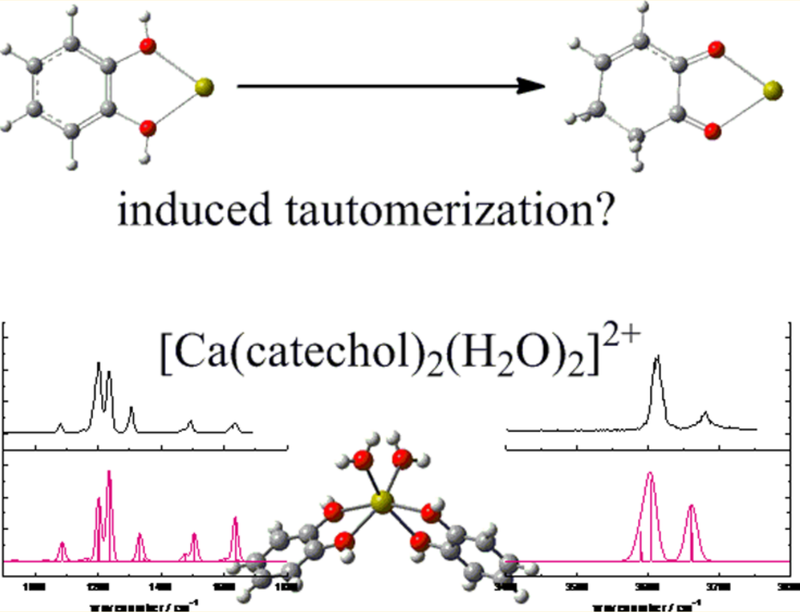 The gas phase structures of [Ca(catechol) 2(H2O)]2+ and [Ca(catechol) 2(H2O)2]2+ have been assayed by IR multiphoton dissociation (IRMPD) spectroscopy, recording their vibrational spectra in the 3450−3750 cm-1 range (OH stretching region) and in the 900−1700 cm−1 fingerprint spectral region. The agreement between experimental and calculated IR spectra of the selected cluster ions confirmed the suitability of the proposed geometries. In addition, quantum chemical calculations at the B3LYP/6-311+G(d,p) level of theory were performed for [Ca(catechol) 2(H2O)]2+ to gain insight into the major routes of dissociation. The results suggest that loss of the water molecule is the lowest energy fragmentation channel followed by charge separation products and neutral loss of one catechol molecule, in agreement with the product ions observed upon collision-induced dissociation (CID).